FORMER Shelbourne coach Brian Donnelly has become Drogheda United's second new manager in the space of two weeks, following the shock resignation of Paul Lumsden. Donnelly will work alongside the club's director of football Darius Kierans, who cannot be manager in name because he hasn't yet completed his 'A' Licence coaching qualification. Shels assistant boss Collie O'Neill was Drogheda's initial target after the departure of Lumsden, but he turned down the offer and it was then that the club turned to O'Neill's colleague. Donnelly said: I'm really looking forward to taking over as manager of Drogheda United. It's a great club and I see loads of potential in the first team and in the talent coming through from the underage teams. 'Right now the first team has what I feel is a great blend of experience, passion and talented youth. Confirming the new appointment yesterday ( Tuesday), Kierans said: 'Brian came up and met the players on Sunday morning and it went very well, and we're happy that he's come in. 'He, Rory and I share a similar vision and central to that is our belief in the importance of a very strong youth policy and talent that flows through from the youths to the 'A' Championship and eventually to the first team. Fans will get their first look at the new man when Drogheda travel to Morton Stadium next Monday for a big league match against Sporting Fingal (kick-off 7.45pm). The game was put back because Liam Buckley's team are in Europa League action against Maritimo in Madeira tomorrow ( Thursday) and don't return to Dublin until Sunday. That may allow Paul Crowley to recover in time from the hamstring injury that saw him miss the ill-fated Bohemians game, while Robbie Martin is also back in training, but the game will probably still come too soon for Jamie Harris and Darragh McNamara. More worryingly, it's been confirmed that Brendan McGill has suffered medial ligament damage and is out for six to eight weeks. 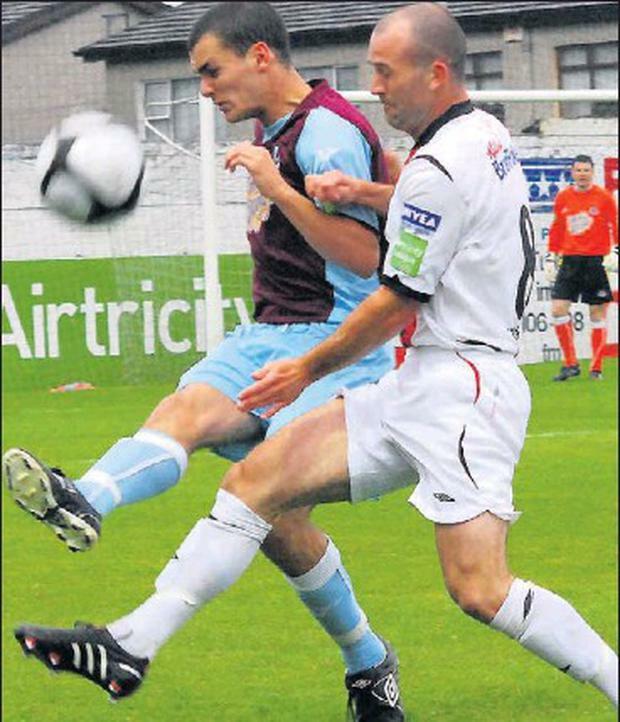 Gareth O'Connor has played his last game for Drogheda as he has returned to his former club St Patrick's in order to trim the wage bill at Hunky Dorys Park. And Kierans indicated yesterday that there could be further departures during the transfer window because of financial constraints, despite last Saturday's Duck Derby on the River Boyne raising approximately €5,000 for the club. Kierans said: 'We'll be hoping we're set up right against them and, like any team, they have their weaknesses. Drogheda host Glebe North in a behind-closed-doors game tonight ( Wednesday).